Special Promotions or a Cart Rule allows you to setup Promotional codes for providing your customers with vouchers for discounts, sending a free gift to your customer or applying a free shipping option to a product. 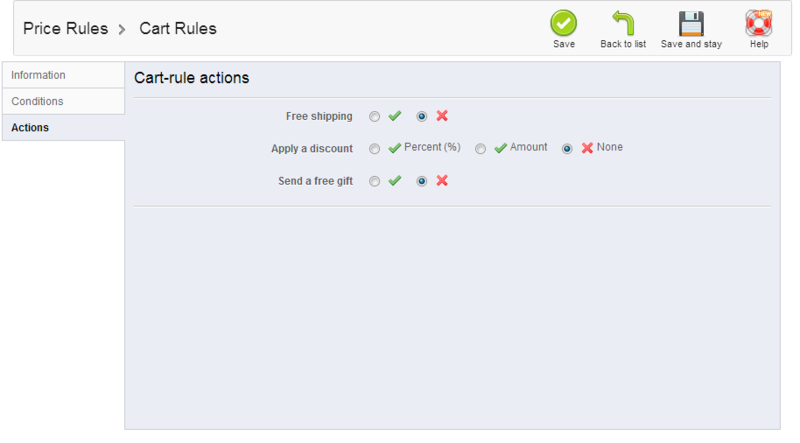 In order to set such promotion you will need to access your Stores admin backend > Price Rules > Cart Rules. 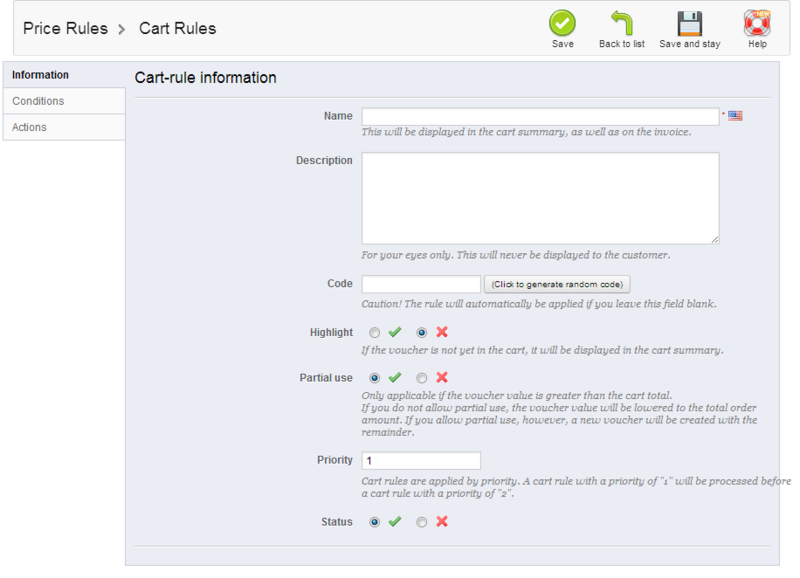 On the home page of your Cart Rules you will be able to see all of your current Cart Rules so you can edit any of them if you need to in the table view located at the center of the page. In order to add a Tax Rule you will need to simply press the Add new button and fill the required fields. The first tab of the Add Cart Rules interface is the Information Tab where you should input all of the required information for your Rule. Name – The name of the rule will serve as a descriptor for what this rule will be applying to the customer’s invoice. Description – The description is for your personal use only as it will be not shown to the customer. Partial Use – If the voucher value is greater than the cart total amount it will not be applied. Priority – The priority how the specific rule should be processed. Valid - The period which the promotion will be applied for. Minimum Amount - The value of the cart bellow which the promotion will not be applied. Total available – The number of customers which this promotion can be used by. Total available for each user – The number of times which a single user will be able to use the promotion. The last tab from the Add Cart Rules is the Actions tab. This tab is for what the special promotion will be used for. Apply a discount – The discount can be configured to be either a percentage value or a flat amount. Once you press the Save button your special promotion will be saved and your clients will be able to directly use it If you have configured the promotion as Enabled.